I have been creating a huge body of work on the topic of organizing genealogy records, a topic that has just about always interested me. I have given presentations on the topic of organization in the past, usually titling it, “Information Overload.” Information is what we are trying to organize, after all. Genealogists have collected and generated information in the form of paper, for the most part, for decades. And now that we have digital capabilities (or at least most of us do) we are probably all working with a hybrid of systems – part filing cabinet, boxes, or three-ring binders, and part computer files – JPEGs, PDFs, .Docs, some created in databases, and some audio or video files. The electronic files could be on our personal computers, our mobile devices, or online. I am working toward presentation of a lecture at the upcoming, 2012 Federation of Genealogical Societies’ Conference in Birmingham, Alabama, “Indians, Squatter, Settlers, and Soldiers in the ‘Old Southwest,’” to be held August 29-September 1. My lecture, “Information Overload: Organizing Your Genealogy Records,” is scheduled for the afternoon of Thursday, August 30, and is intended for the beginner level genealogist. Download the Conference Brochure here: fgs_2012registrationbooklettopress. In anticipation of my need to organize (”reign in”) the myriad of ideas and techniques that I have assembled on the topic, I scheduled a preliminary presentation for the Tulsa City-County Library’s Family History Month, organized by Kathy Huber, MLS, the genealogy librarian, for Saturday, July 7 – last Saturday. The turnout was overwhelming. There were 150 attendees for this afternoon session of a Saturday for which two other programs were also presented – all were appropriate for all levels, but helpful for even those who had been researching their families for decades. I saw faces of some that I know are not new to genealogy, but from a show of hands there were probably at least 30 there who were newcomers. Frossard Auditorium at Hardesty Library was packed – making for the kind of venue where, instead of having an empty chair between you and the stranger next to you, there is hardly an empty seat. This was, I think, indicative of a desire of many to get started, especially with the current attraction and potential effectiveness of online searching – something that was certainly not a part of my own beginning interested in my family’s history. Of course the cool library (take that either way) was the place to be on such a hot, Oklahoma day, and it accounted for some attendance, but so did the scores of area residents, as well as those who made the drive from outside Tulsa, because they had experienced TCCL’s successful programming during its Family History Month in previous years. Download a PDF guide to July’s Family History Month programming here. Because of the crowds, not everyone present received the handout, and so Liz Walker of the Genealogy Center has made a PDF version available on the Genealogy Center’s section of the TCCL website. To download the file, click on the link to Information Overload. You’ll have the option to print it out, or read and save it on your computer or mobile device – just as you often will have with your genealogy records going forward. www.shoeboxed.com – service that scans your documents, sorts them and makes the archives available at Evernote.com. Nancy Shively’s new blog – I recommend that you follow Nancy’s blog. Her writing and the information she shares combine to make her blog a pleasure to read. She recently finished her term as the Family Tree Firsts blogger for FamilyTreeMagazine.com and was an official blogger for RootsTech 2012. I hope to write again soon with tips on organization of your genealogy records. To sign up to receive an email of future blog posts, enter your email address in the second box on the left (Feed My Inbox will be sending the emails). Desmond Walls Allen will be in Tulsa to present a workshop for the Tulsa City County Library on Saturday, 23 April, and I am very excited. I had a chance to meet Desmond at the FGS Conference in Little Rock in 2009, and I have always been a huge fan. She is a very witty and bright speaker and she has such a wonderful depth of knowledge about any of her topics that I always learn when I attend one of her lectures. Desmond is a professional genealogist from Arkansas, who has published numerous books for genealogists to use to find Arkansas ancestors. I found 42 in the library’s catalog, most of which can be found at the Genealogy Center. She is the author of First Steps in Genealogy: a Beginner’s Guide to Researching Your Family History, which is available for check-out to library cardholders at several of the branches. Discover how you can use your digital camera to document your family history research. Learn how to photograph records, cemeteries, heirlooms and old photographs, as well as touch up old photographs to make them a great addition to research notebooks and scrapbooks. I haven’t heard whether she will have any of her books for sale, but you might want to bring some money along, just in case. I look forward to seeing you there. 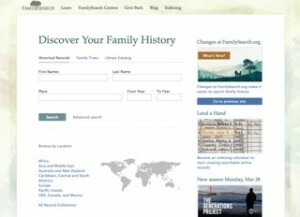 Have you tried FamilySearch? It’s a large, free website for genealogists, provided by The Church of Jesus Christ of Latter-day Saints. It is somewhat complex, and is currently undergoing some very serious updating. So, you may find it challenging to try to locate the information you need, and to know whether you have found everything there is to find. Want a list of genealogy terms in French? Want to find online lectures? Want to find which roll of microfilm might have your ancestor’s will? Or maybe you want to find published genealogies on the surname of your ancestor? Let me help you. I will be presenting an even newer “What’s New” lecture on Saturday, April 9, from 10:30 to 12:30 at the Tulsa City County Library’s Genealogy Center. This is a free, two-hour program, and is an update to what I’ve presented previously. The objective is to help explain where FamilySearch has been, where it’s going, and how to use it now. I will be available afterward to answer questions, too. I hope to see you there. Please tell me that you learned about the program from reading my blog post! * When you click the link, you’ll be downloading a pdf brochure, which may be opened using Adobe Acrobat Reader. Several weeks ago Footnote.com (as part of iArchives) agreed to be acquired by Ancestry.com and that transaction has officially closed today. As we join forces with Ancestry.com there is a huge opportunity to leverage each other’s strengths and move even faster toward our goals. You may be curious about how this deal effects members of Footnote.com? The plan is to continue to run Footnote.com the way we have always run Footnote.com — continuing to do what we believe is best for our customers, our business and our brand. Now that the deal is officially closed we are excited to leverage some of Ancestry.com’s resources and expertise to take Footnote.com to the next level. It has been exciting to see Footnote.com grow over the past 4 years. Footnote.com started with only 5 million historical documents and today we have nearly 70 million searchable documents, over 1 million members, nearly 100,000 Footnote Pages, and over half million annotations added. We couldn’t have done it without our members and the great team at Footnote.com and we are excited for Ancestry.com’s support in the next chapter. I am glad to hear that Footnote.com will stay the same for now and will have the resources of the larger organization to make it even better. We talked about Footnote in class yesterday — and found Abraham Lincoln’s 1860 U.S. Federal Census image. Remember that Footnote.com has some historical documents that are free to view, and that library cardholders at the Tulsa City-County Library have access to Footnote.com at the Genealogy Center. To take a look at Footnote.com, visit www.footnote.com. Mark Saturday, March 6, on your calendar for a chance to learn about German genealogy research, and about some German genealogy resources at the Tulsa City-County Library’s Genealogy Center. I have been teaching myself to research using German genealogy resources for a while now. I have also been trying to learn to speak a little German and have learned to read some of the old Gothic print that was used in pre-World War II records. I have located and studied parish registers for Berwangen, the small town in Baden where my great-great-grandfather, John George (or Johan Georg) Mayer was christened in 1826. The parish registers were microfilmed by the Genealogical Society of Utah in 1978 and 1982, and so I have accessed them through the Family History Library in Salt Lake City, Utah, by way of the New Haven Family History Center. There are three Family History Centers in Tulsa now — two in churches of the Church of Jesus Christ of Latter-day Saints and a new one at the Genealogy Center. 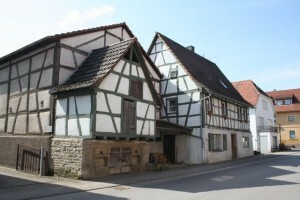 While anyone can order genealogical records on microfilm for a reasonable price through any of the three, the Genealogy Center has also been collecting German resources in print which anyone can use to help locate small towns like Berwangen. The location of the records is closely tied to the place where your ancestor lived. I have learned to use both the multi-volume resource, Map Guide to German Parish Registers, a great new resource, and Meyers Orts- und Verkehrs-Lexikon des Deutschen Reichs, an important resource written in German, which was first published in 1913, and I’d like to explain the process of using both of these to anyone else who is interested. Last spring I visited Berwangen. Although I didn’t actually do any genealogy research while in Germany, we met some wonderful people. The day that my daughter and I spent in Berwangen was the best day of our two-week trip around Europe. Before the trip, I learned to use maps on Google and while there we took pictures and video. Now that I have been there, I am anxious to learn more about the history of my ancestors in this town. The Genealogy Center is located at 2910 S. Harvard in Tulsa. The free program will be in the Harmon Foundation Meeting Room from 2:00 – 3:30. I hope to see you there.